Dublin, Ireland – August 27th, 2015 – StoryToys and Saban Brands today announced the release of Power Rangers Dino Charge Rumble, a 3D game for tablets and mobile phones integrating original comic book animation. Designed for Power Rangers fans of all ages to enjoy, the app is available from August 27th on the App Store, and is coming very soon to Google Play. First launched in 1993, Saban’s Power Rangers quickly became the most-watched children’s television program in the United States and remains one of the top-rated and longest running children’s action series in television history. The winning formula combines action, adventure, humor and heart with themes of teamwork, fitness, friendship and helping others. 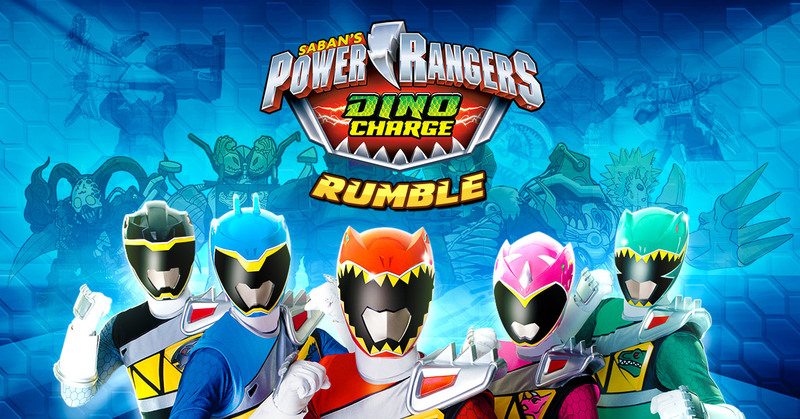 Power Rangers Dino Charge Rumble is a brand-new app based on the latest Power Rangers TV season, which returns to a dinosaur theme, one of the most popular themes throughout the history of the franchise. The app presents an original Power Rangers Dino Charge story in a 2D comic strip narrative, combined with stunning 3D ‘battles’ between the Rangers and their alien opponents. Rangers, villains, Megazords and more are featured in the game where players can battle the evil Sledge and his monster army with simple taps and easy swipes. Players can also master all the Ranger moves, choose between a range of weapons or giant robots towering over the city and control different Megazord formations in a clash with super-sized villains. There are seven chapters with over 20 levels to explore and master. Additionally, the game engine adapts to reflect the playing ability of the user. The ease-of-use and contact-free action make this app suitable for even the youngest of fans, while dramatic visual effects and animations combined with a sophisticated comic book and mini games ensure that it will also have strong appeal for older fans. “Saban’s Power Rangers is one of the world’s most popular and enduring children’s brands, and we’re thrilled to have partnered with Saban Brands to create a fresh and innovative experience for fans of all ages,” said Barry O’Neill, CEO of StoryToys. “We are constantly looking for new ways to enhance the brand experience for our passionate Power Rangers fan base and working with StoryToys has allowed us to provide a brand-new digital product for fans to enjoy alongside the Power Rangers Dino Charge TV show,” said Brian Maeda, VP of Consumer Products, Saban Brands. For further details, screenshots, info or if you would like a review code please contact press@storytoys.com. Power Rangers Dino Charge Rumble is free to download with a one-off payment of $3.99 / €3.99 / £2.99 to unlock the full game. There are no other in-app purchases. Headquartered in Dublin, Ireland, StoryToys creates and publishes highly innovative and entertaining software for children including interactive books and games and has enjoyed global success on all major app distribution platforms, including over 250 number 1s worldwide on the App Store. StoryToys has been the recipient of numerous awards and commendations for the quality of its products, including 17 prestigious Children’s Technology Review Editor’s Choice Awards and the BolognaRagazzi Digital Award. More information about StoryToys is available at https://storytoys.com/. StoryToys is a registered trademark of StoryToys Ltd. Apple, iPad, iPhone and iPod touch are trademarks of Apple Inc., registered in the U.S. and other countries. App Store is a service mark of Apple Inc. Formed in 2010 as an affiliate of Saban Capital Group, Saban Brands (SB) acquires and develops a world-class portfolio of properties in the entertainment and lifestyle sectors. SB applies a global 360-degree management approach to growing and monetizing its brands through content, media, marketing, distribution, licensing and retail to markets worldwide and consumers of all ages. Saban Brands Entertainment Group (SBEG) develops innovative branded content that resonates with consumers across all media platforms. SBEG’s growing entertainment portfolio of brands includes Power Rangers, Julius Jr., Popples, Cirque du Soleil – Luna Petunia, La Banda, Emojiville (working title) and others in development. Saban Brands Lifestyle Group (SBLG) drives major expansion within the company’s diverse portfolio of fashion and lifestyle properties. SBLG’s portfolio currently includes Paul Frank, Macbeth, Mambo and Piping Hot. SB operates a global network of offices in Los Angeles, New York, London and Sydney. For more information, visit www.sabanbrands.com.